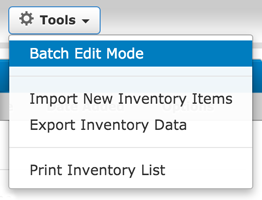 If you’re needing to mass delete or archive a lot of your inventory items quickly, batch edit mode is a great tool for this. Using SalesBinder’s batch edit mode you can check off specific inventory items (or the entire page in 1 click) and then either delete or archive them. Note: It may take a little while for the entire process to complete since it’s updating many records at once (usually no more than 30 seconds).